Legs down on another site. This time we chose a site run by a lovely Dutch couple, on the side of another mountain. This holiday is starting to repeat itself. 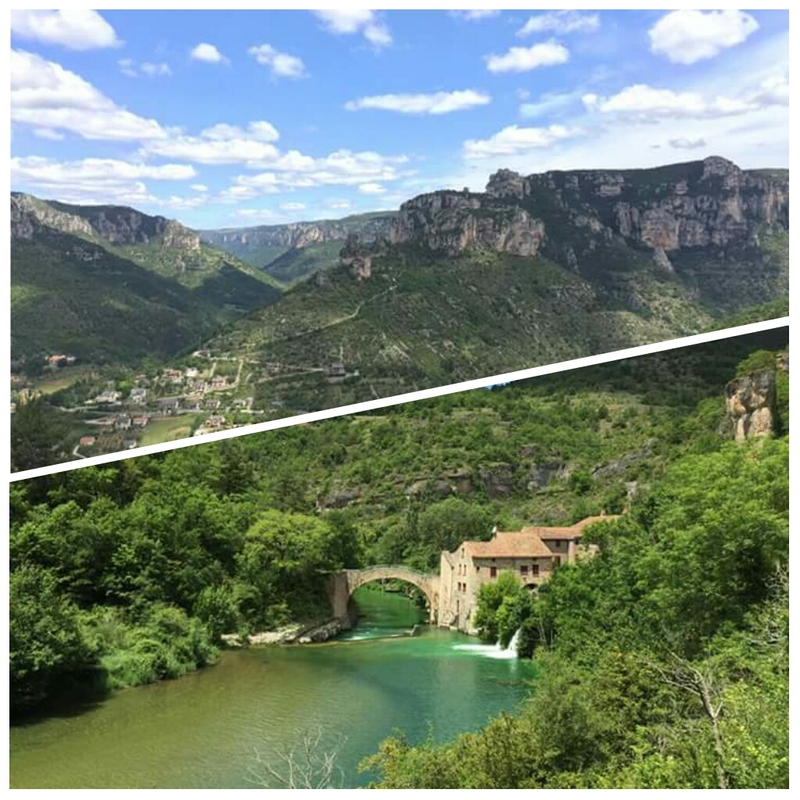 Just in case I haven’t mentioned before, The Boss has a love of mountains, bridges, waterfalls, old cemeteries, castles and war graves. On route he starts getting excited. “Get the camera ready! 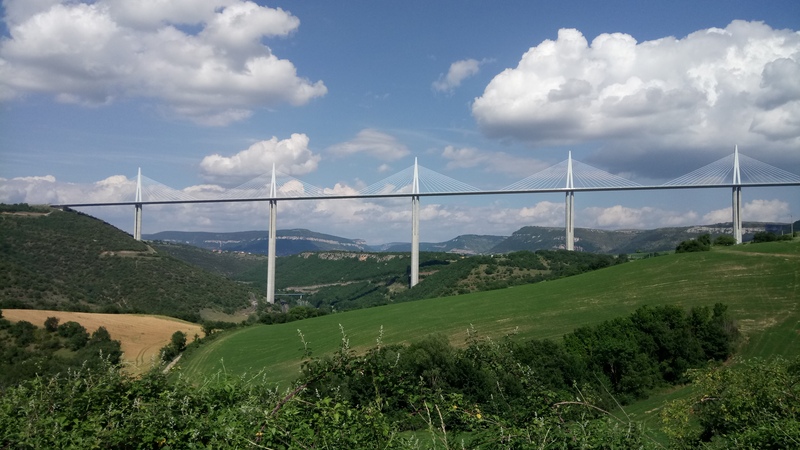 The Millau Viaduct will soon be in view!” We are still 14 miles away and in this mountainous region we aren’t seeing anything whilst we are down in the valley for a long time. Still I sit, holding the camera on my knees as instructed wishing I’d said it’s too soon to get the camera out. Then when it finally loomed into view after what felt like a life time I could’ve said “I told you so!” My inner child stays quiet and I point the camera and click away. This way and that way hoping I’ve got the shot he wants. Chances of that are slim. In the old days cameras had view finders, this one had a screen in the back in 30° heat and in glaring sunshine the screen appears black, I could be snapping anything. I’m on a promise, we are going to get a bit more up close and personal with this bridge in the next few days. Can’t wait. Going back to getting on site, each and every pitch is privy to a wonderful view. The site is stepped and up a very steep hill. He sure knows how to pick these sites, my little legs don’t do hills. Once again communal facilities, I choose to use our bathroom in the caravan. Strange man noises in the next cubicle make me shudder. A trip out in the car and we drive to what from the caravan appears to be a huge spit of rock looming up out of the ground. We’ve been reliably informed that if you get up there there’s actually a castle on top of it, Peyrelade. Negotiating a single track road with very few passing places, we get the feeling it’s either closed or we’ve got the place to ourselves. We parked the car under the solitary tree for shade, it’s hot and another hill looms above us up to the castle. The fact that our car was the only car in the car park should’ve told us it was shut. It would’ve been €4.50 per adult to get in as it was shut and I’d climbed a good few rickety steps to get up here might as well have a mooch around outside, admire the vista and take a few pics looking back towards our campsite. 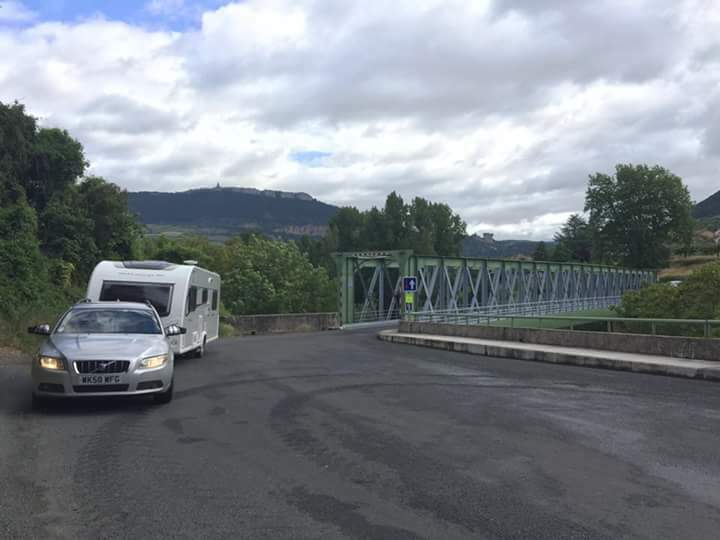 In need of supplies we head towards Millau, apparently the supermarket is near the bridge, hmmm. We pass underneath the bridge but there are no stopping places to take a picture. Before we know it we are driving into a small village, Peyre, that appears to be half built into the rockface, he is instantly distracted and the further appeal of a ‘gratuit’ car park outside the village sealed the deal. Once again we are walking up steep hills to view buildings that were built around the 17th Century. 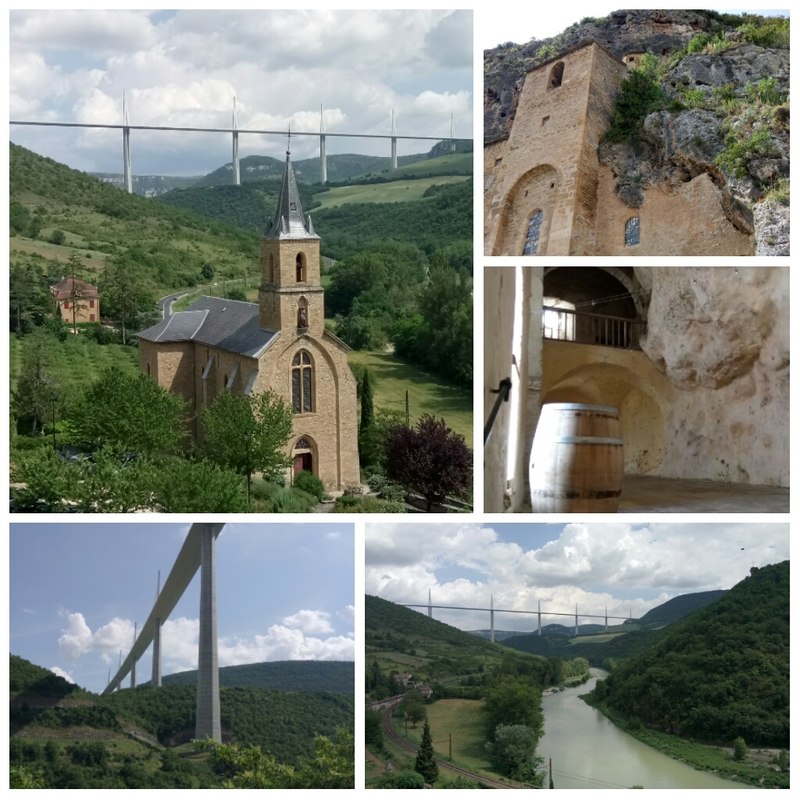 By using the rockface as the rear structure, classed as troglodyte, the residents had strictly ‘forward’ views only, which today, centuries later, was offering a picture frame view of the Millau Viaduct, an interesting mix of old and new in one spot. Still in need of supplies we continued to the supermarket via every road under, near or around the bridge so hopefully The Boss finally got the picture he wanted. No Lidl in town so we elect for Carrefour today where we have the usual ‘Wine’ debate, The Boss looks at the €4 bottles and I look at the €2 bottles, we normally buy a mix of both then he concedes later the cheap stuff is actually very nice. 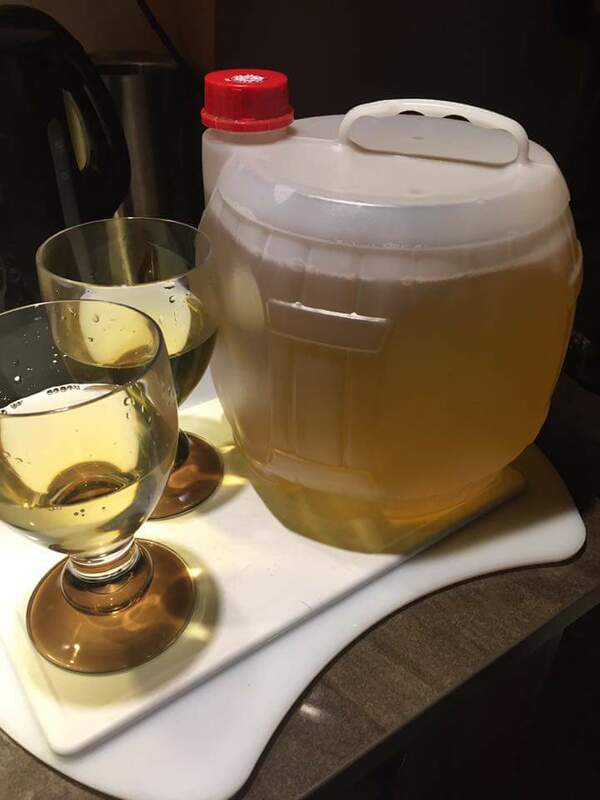 Today I win the debate and we leave with a 5 Litre plastic bottle of local white wine for €9!! The verdict? Very, very, drinkable, we have purchased local wine in plastic bottles on previous trips to France and are yet to be disappointed. The Boss decides that being up a hill is no excuse and a Tandem Day is planned. As we descend the eight miles into town he points out all the ‘oldies’ effortlessly riding up the hill, “But Steve, those bikes all have electric motors” … No reply. 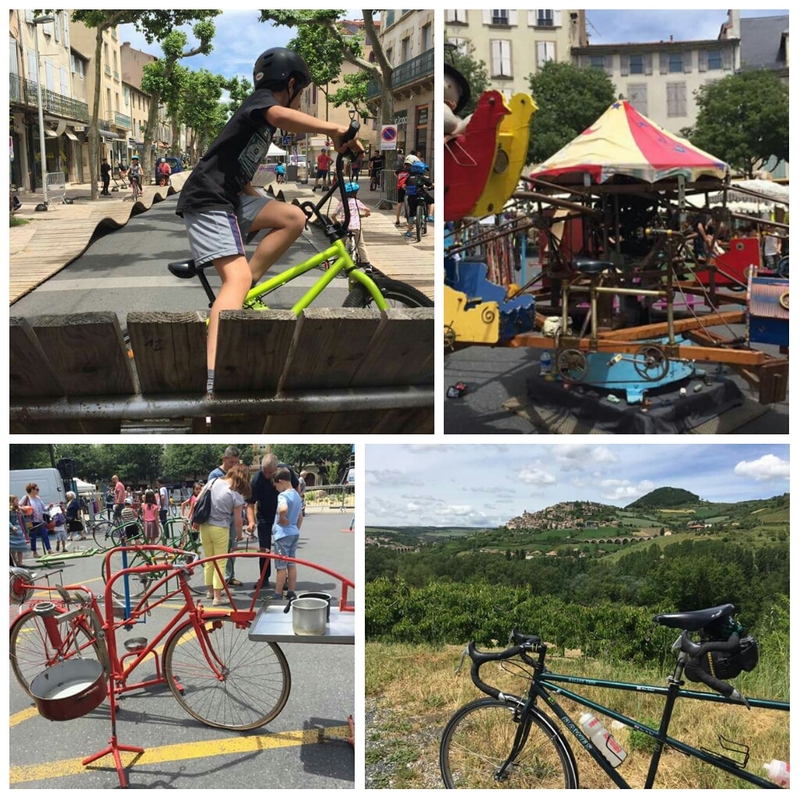 We ride into the centre of Millau, where, ironically, there is a bike festival taking place, and very popular it seems too. 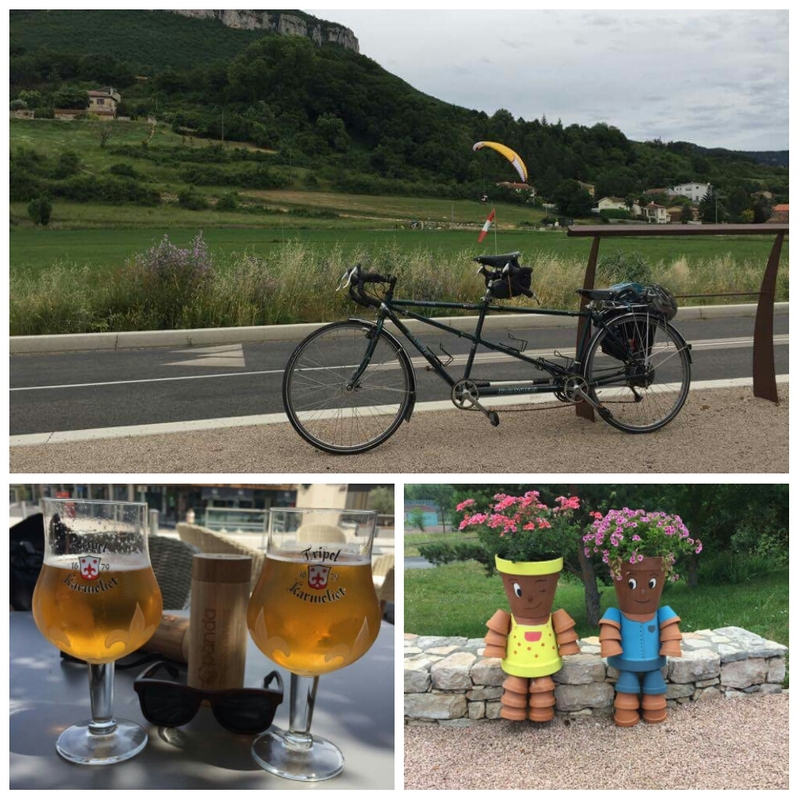 After pedalling through the festival with a few French versions of “She’s not pedalling at the back” called from the stalls, we retire to a busy street side bar and order “Deux grandes bières s’il vous plaît” while we watched about twenty paragliders leaping off the mountaintop and circling with ease. €16 later, the beer was good, but not €16 good, we set off up the hill, with a thirty minute rest while we watched the paragliders now landing in the field on our route. The gradient on the eight mile climb back was within our comfort zone so we made good progress back to the site, where The Boss stubbornly insisted on showing the ‘electric motor’ brigade we could ride up the final, near vertical, hundred metres, while Hans, the site owner, shouted “She’s not pedalling at the back”. Grrr. We came to this area with little knowledge and no expectations thinking it would be a transfer point on our general route. 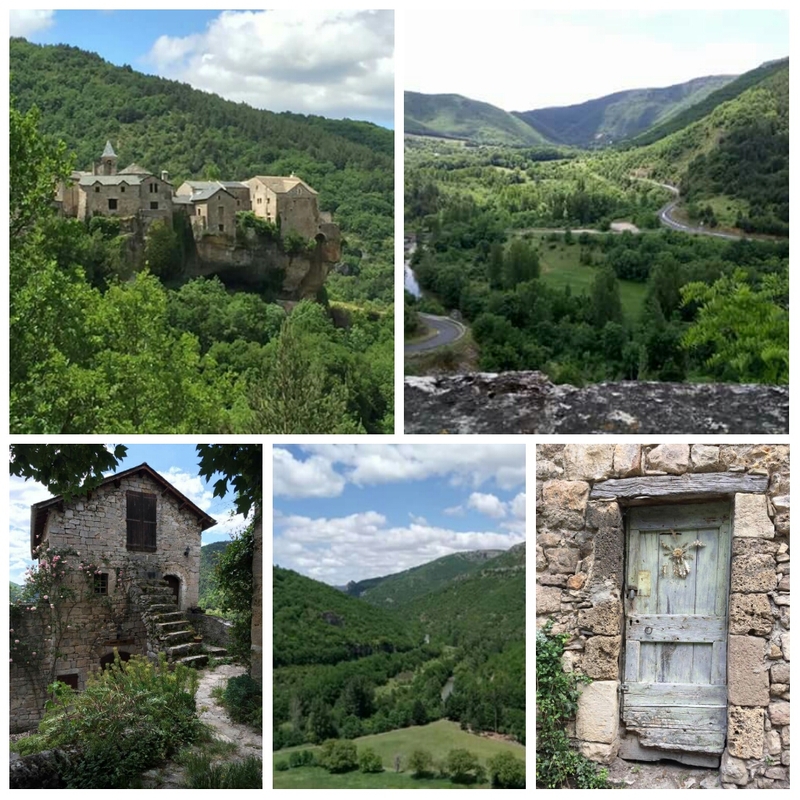 It turns out that the Aveyron area of France is stunning. 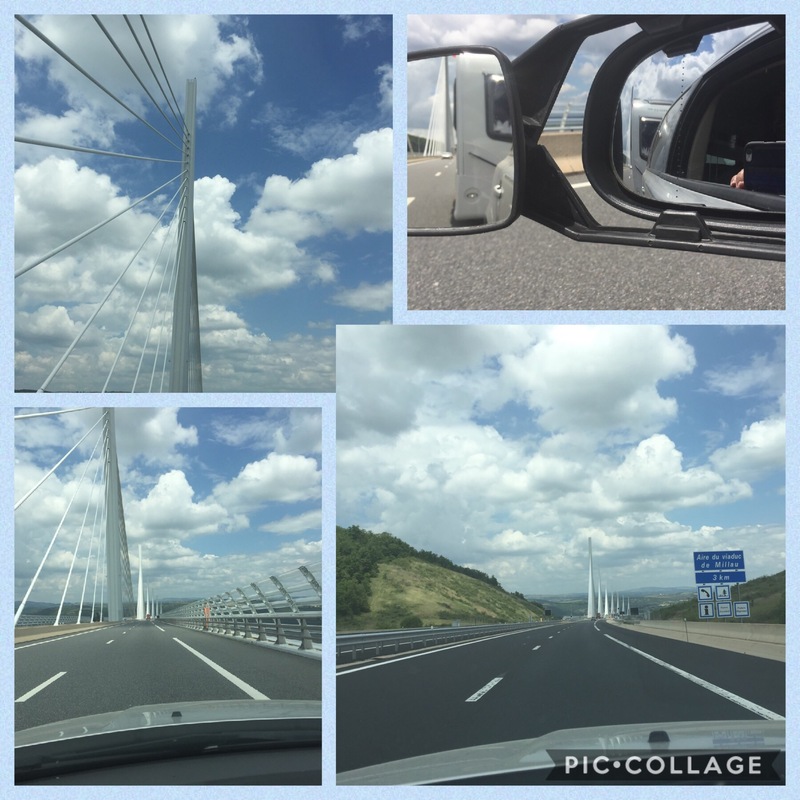 We jump in the car for a pleasure drive, La Couvertoirade is the vague destination but today we are enjoying scenery. La Cresse to Peyreleau along The Tarn, over the mountain, zig-zagging higher as each corner revealed a bigger view, dropping down to La Roque Ste-Marguerite via a road that had multiple weight, length and vehicle restrictions, plus some French word ‘Danger’, “No car restrictions, should be fun” says The Boss as we descend single track, no passing places, gravel surface with sheer drops into the deep gorge. We live to tell the tale and emerge onto the D991 running alongside the La Dourbie river and the ‘greenest’ water we have ever seen. 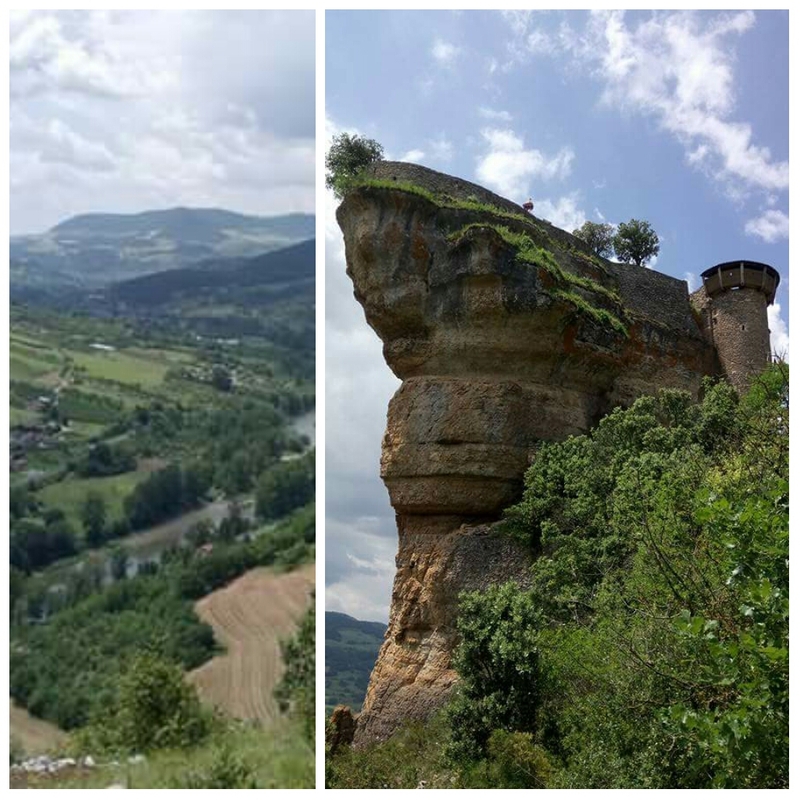 Soon after we spy a village that appears to be perched very precariously on an overhanging rock, we go for a closer look. Cantobre turns out to be a very rare thing, beautiful to look at, beautiful to look from, no ‘tat’ shops or cafes, just a village being a village. Our only complaint? Two or three post boxes had English nameplates suggesting holiday homes, as with many places we would prefer them to be ‘locals only’ rather than standing empty. By contrast, La Couvertoirade is a little disappointing. 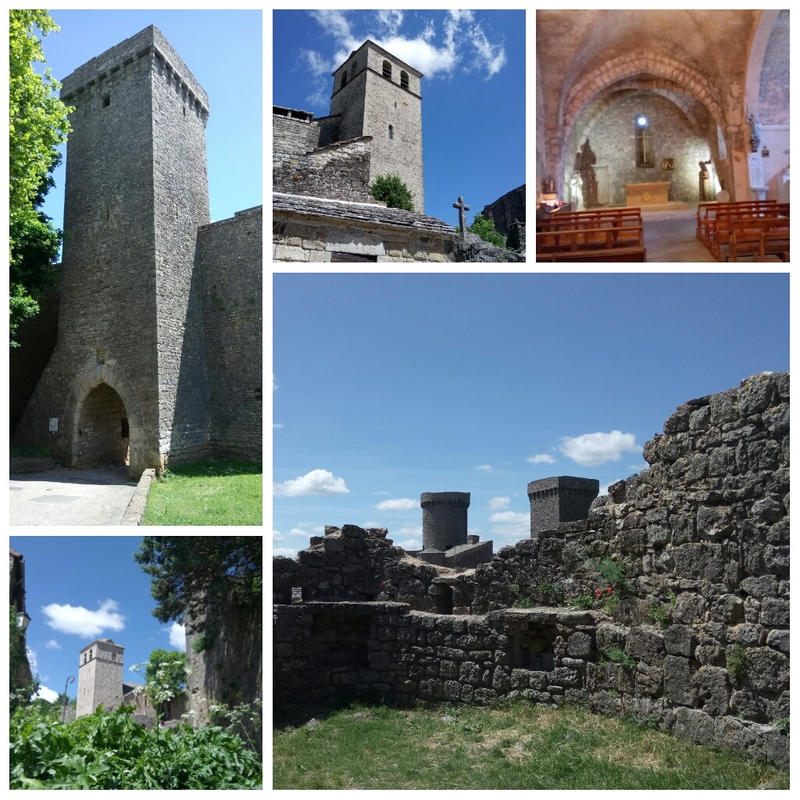 One of five local towns originally built up between the 12th and 15th Centuries by the Knights Templar. Although some parts are restored the village does feel as it would ‘back in history’, only today, each building is either a restaurant or a souvenir shop selling exactly the same as next doors souvenir shop. It was busy too, this probably had an impact on our disappointment. As we exit the car park our car starts to make the most horrendous screeching noise, we have suddenly become the main attraction. After a quick look underneath The Boss decides to drive on smiling at all our new admirers, then stops at the very first empty layby and stops acting so cool. He’s convinced it’s a stone in the brakes but can’t see or shift it. 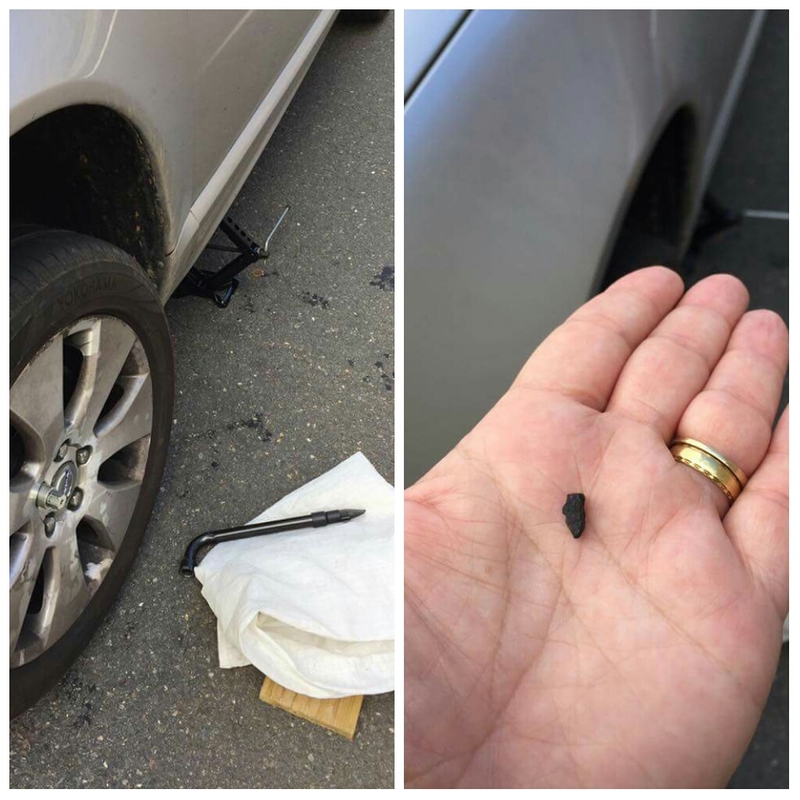 We try the “See what develops” method for a further ten miles and two pointing villages before giving in and removing the wheel and the offending stone fell out from the brakes. Hate it when he’s right, but so relieved too. Looking forward to the next encounter! A great Blog as usual, very pleased that you are pursuing your dream, we are very jealous, but one day who knows …….